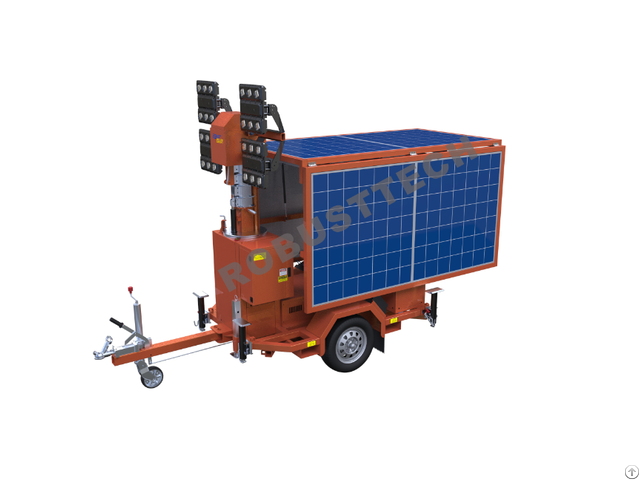 The RPLT-3800 series lighting tower stands feature an innovative hybrid diesel/electric battery system with automatic charging. This allows silent continuous operation until battery depletion is reached (set at 30% charge). The generator will then restore charge without any loss of lighting allowing quiet continuous operation. Posted By: Fujian Robusttech Co.,Ltd. Business Description: Established in 1990,Robust Power is one of the world's leading manufacturers of LED Lighting Towers,LED Lighting products and power generation equipment. Our team of engineers and designers have developed a full range of LED innovative lighting solutions to suit a range of applications. We are dedicated to providing customers worldwide with the most efficient and practical illumination products. Our products are tried and tested and are built to withstand the worlds harshest industries including mining and civil,construction as well as retail and commercial applications. Located in Fuzhou, China our Brand New 18,000m multi-level manufacturing facility employs over 100 personnel and enable large scale production without compromising safety and quality. Our technicians ensure that quality control of our products meet and exceed the standards that our customers expect. Robust Power have attained ISO9001:2000 AND CE accreditation and continue to strive to be the number one LED lighting tower and power generation manufacture worldwide.